As I stated in the first post in this blog, one of my obsessions over the past few years has been idea of hiking the Appalachian Trail. However, my situation (job; small children), precludes taking 4-6 months off to hike in the woods at the moment. But the obsession still smolders on, and I've become an arm-chair hiker; I read any account of the trail I can find, both published and on a great web-site called Trail Journals. This is enjoyable, but what I really want to do is to start chipping away at the 2,100 miles of the trail. So, whenever the opportunity arises, I try to get in a few miles on the trail. Last year, in exchange for agreeing to do the dishes for a year, I was able to do a week on the trail. This year, as part of our family summer vacation, we stayed in a cottage near Rangelely, Maine. Not accidentally, the cottage was about 4 miles from the trail. The agreement with my wife is that I could peel off for a few hours and do a long run on the AT. She dropped me off at a place where the AT crosses a road (Maine Route 17). My goal was to run from there to the next road crossing, a distance of 13 miles, where she would pick me up. Optimistically, I estimated that this would take 3 hours. I didn't have the AT map for this section of trail, as I could only obtain it by buying the entire set of maps and the guidebook for the entire state. Though I was sorely tempted to do so, they would only see one use on this trip, and I couldn't justify this. The view from my drop-off location, a lay by called "Height of Land", was terrific. You could see the unbroken northern Maine forest, and the impressive Megooselookmeguntic Lake below. Ominously, rain appeared to be sweeping up the lake towards us. My wife, 6-year-old daughter, and I had a sandwich together at the lay by. My 4-year-old son napped in the back seat of our car. I waved to my wife and daughter, and started trotting towards the trail. Their plan was to go to the beach while I ran, weather permitting. I carried a new, lightweight pack that I'd purchased at L.L. Bean in Freeport, Maine, earlier this week. In it I had a 1/2 liter bottle of water, and a 1/2 liter of Gatorade that I'd made up. I also had a rain jacket, hat, compass, map (covering just the last two miles of the section), and some chocolate doughnuts. I haven't encountered these doughnuts in the UK, and I know they are junk, but I remember them from growing up in the US. 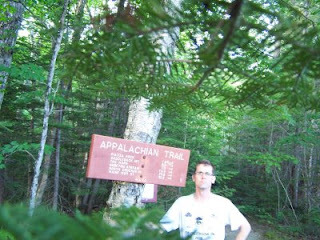 The trail at the start was overgrown, and, typical of the AT, seemed to climb immediately. Within a few minutes it began to rain. I donned my jacket and hat and continued. Soon, the rain intensified, and I took shelter under a hemlock tree. At my feet the forest floor was covered with needles. The trees were mostly hemlock, pine, and birch. The rain grew louder, and changed to hail. I considered turning back, but I thought that my wife would have left already. There was a rumble of thunder. I looked at my watch. I was 25 mins into the run, but had only run for a few of these minutes. I decided to wait 10 more minutes, and then push on. The rain clouds that I'd seen over the lake seemed to be moving quickly, so hopefully the rain would pass soon. At about 35 mins into my "run", I moved back to the trail. The heavy rain had made the trail a bit of a stream in places. Large puddles formed in flat spots, and the muddy water in these eventually overflowed and flowed down the trail. Maine, apparently, had experienced a wet summer, and the trail already muddy. In addition, this particular section of the trail crossed many bogs, and the log posts bridging these were not always sufficient. I ran/walked on. I wanted to keep my feet dry for as long as possible. Where the trail was under water or extremely muddy, I tried to skirt around its side, or pick my way over boulders and tree roots within the mud. This worked, but took time. Eventually I came to a pond. It was like a post-card; a still body of water surrounded by trees. No moose however. I tried to run when I could, but this would only be stretches of 100 meters or so. Then it was picking my way through the mud and water. I came to a shelter (a bothy-like structure occurring every 10 or so miles on the trail). I signed the register, an AT-hiker tradition, and chatted with a couple who had started their hike several weeks ago in Vermont. They were debating about whether to continue today, or stay in this shelter for the evening. They opted to continue. At this point I was 1.5 hours into the run, but had only come about 4 miles. At this rate, I'd be quite late for my pick-up. All I could do was keep moving. The sun came out occasionally, and I was able to take off my rain jacket. I drank my water, and ate my doughnuts. At one boggy stretch I stepped onto a log that moved, and a splash of cold bog water shot up my shorts. At another, I mis-judged the firmness of the ground and immersed my foot in mud. 3 hours and 20 mins into the run, I came to a campsite. A sign there indicated that it was 4.8 miles to the next road crossing. Could I do this in 40mins and only be an hour late? Fortunately, the trail now featured longer runnable stretches. It was also somewhat downhill. I was tiring, and a song that I'd heard in the only radio station we could get in our cottage now ran through my head: I am woman, here me roar, in numbers to big to ignore. This wouldn't have been my first choice of songs, but it kept me going. I ran into a women hiker going the opposite direction on the trail, who said they'd seen my fan club a ways up the trail. I was encouraged by this, as it meant they might not just have been waiting for me, but getting in a little hike. At 4 hours and 24 mins I emerged from the woods and entered the road-side parking lot. My family were waiting inside the car, as the rain had returned in earnest. I put my rain jacket on the car seat, to protect the upholstery from my muddy legs, and climbed in.